A large toy tiger in a UK field has sparked a major police operation involving armed officers and a helicopter team. 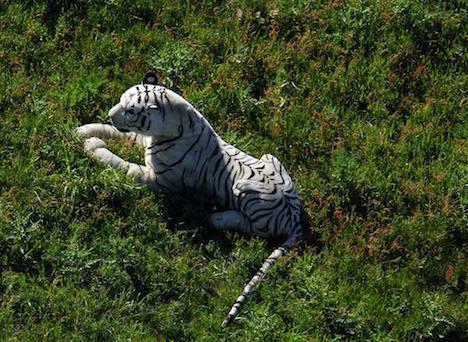 To their alarm, Hampshire police were alerted to the existence of what appeared to be a white tiger in a grassy field in Hedge End, near Southhampton. Members of the public had reported the sighting of the rare beast on Saturday afternoon. After an initial visual investigation by one unnamed officer, the local zoo was called to arrange a tranquillizer dart for the big cat. A helicopter was dispatched with a team of police officers to deal with the potentially dangerous situation for the public. The helicopter team discovered that the tiger was in fact a life-sized, stuffed toy. Using a heat sensitive camera, the chopper team realized the tiger was not moving and there was a distinct lack of heat coming from it. Due to the wind from the helicopter, the toy tiger also rolled over. The tranquillizer dart was not used to subdue the toy. The police are looking for the owner of the toy, and an explanation of how it came to be left in the field. Although, the police have said they “continue to focus on more urgent matters”. Image: Sussex Police photo of the offending soft toy tiger.